The never-before-told story of how Batman gained his Bat-abilities from his Bat-training with his Bat-sensei. Has time run out for comic book movies that aren’t stupid? This film may be a crucial test for whether the subgenre has any juice left in it... at the very least, this may be the last best chance to see if a DC Comics movie can be made that compares in quality to the Marvel Comics movies that have done so well. I’m in suspense: will someone finally manage to do Batman without sucking? Sorry, no. Doing Batman without sucking is apparently too much to ask of anyone. What we have here is a lot of effort to operate on a higher level of storytelling, to bring in psychology and a whiff of Eastern religion and give real depth to the Bruce Wayne story... and yet in the end, all they gave us is a car-chases-and-explosions movie. Delving into Batman’s bat-psychology seems to be an irresistable temptation for bat-scenarists nowadays. Current thought on Batman tends to run along the lines of, as Lyz Kingsley put it: he must fight crime this way because “he’s so psychologically screwed-up that he feels compelled to don a fetishistic costume”. Now, an old school car-chases-and-explosions movie would never take this kind of pseudopsychoanalytical approach... but nowadays? This is in the process of becoming a pretty standard cliché. It certainly felt clichéed in this case. 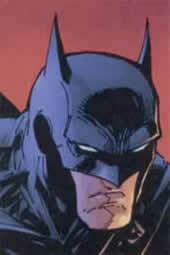 That said, there is some success with the attempt to deepen the Bruce Wayne story. Both his motives and his abilities as Batman come through far more strongly and believably than they ever did in any of the past films. This is the first Bat-movie that gives you some sense of how it’s possible for him to be so formidable in fighting whole gangs of crooks; in all the others they pretty much go “Well, he just can.” And this is the first Bat-movie in which Batman himself is truly the central character and the star of the show, rather than one or more flamboyant hammy villains. And it’s with the villains that the show really falls down. They’re certainly a dangerous enough bunch so that Batman has his hands full trying to stop them... But what we’ve got here is one of the worst cases I’ve ever seen of movie bad guys deciding to be evil for no reason. The explanation they give for why they want to kill everybody just makes no damn sense at all! What it comes down to is, they decide to be evil because Batman needs a suitably formidable opponent, or you haven’t got a movie. This must have sounded pretty good on paper when they were putting it together. The director is Christopher Nolan, who has made some pretty interesting films previously, such as Memento and Insomnia. The cast is top-heavy with big name acting talents: Michael Caine, Morgan Freeman, Gary Oldman, Rutger Hauer, and Liam Neeson. (In this company, Katie Holmes really stands out as... the exception. In this kind of movie the casting of the few female roles could more or less be described as tokenism.) The big names all acquit themselves well, except maybe Oldman as police officer Jim Gordon, who remains nondescript. He wasn’t given much to work with. Besides Holmes, the other non-big-name up-and-coming actors in the cast are Cillian Murphy as The Scarecrow, who turns out to be real good at being creepy but whose role gets cheapened, and Christian Bale in the lead. Bale is the best Batman we’ve had yet, but someone behind the camera is really having him overdo the thing of always speaking in a low whispery husky voice, which is very much in fashion now in Hollywood for how to play a dangerous hero. (And why is he dropping G’s all the time? Doesn’t seem quite appropriate. Since Bale is Welsh, any accent or speech mannerisms he brings to the role have to be intentionally decided...) For that matter, a lot of the dialog was too muttery to follow easily — another bad habit becoming very widespread in current Hollywood practice. Some of the blame is due to the crappy sound system in the theater where I saw it, but still, if I’d been the sound engineer I would have tried a little harder to keep the completely forgettable music from getting in front of the dialog. How is the action? Well, some action scenes felt pasted-in for the sake of more action, rather than organic to the story... and in general, fights are filmed in such a way that it’s hard to tell who’s doing what. They tend to be kind of dim and blurry, which doesn’t help. One area where I have to give the movie a little credit is their attempt to anchor some of the stranger comic book conventions in reality. Why, one wonders, are there supervillains who go around in masked personae? In the comics you just take it as a given, but here there’s a reason: because they see their enemy, Batman, gaining an advantage that way, so they do the same as a countermove. And so on: lots of old pieces of bat-lore get their explanation... too many pieces, in fact; it gets to be intrusive. Leave some for the next movie. Or were you suspecting that you wouldn’t get one? When asked by my friend for my immediate opinion during the closing credits, the first word I came up with was “pretentious”. But if they had just gotten over their car-chases-and-explosions hangups, it might have worked.